There are many traditional and bespoke options available. Coffin choices can be discussed during the funeral arrangements. The Poplar is an MDF coffin, covered with wood effect foil. Fitted with brassed handles. 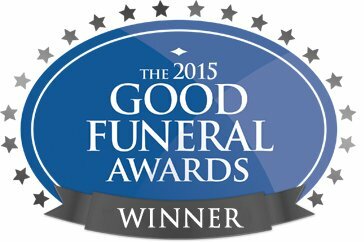 It is a cost effective option, suitable for both burial or cremation. Bespoke Named Coffin is available in any colour veneer, the name can be engraved on either one or both sides. The coffin picture here shows a raised lid, however flat lid options are also available. It is suitable for both burial or cremation. The Mayfair, similar to The Upton in style is a solid oak coffin. With double mouldings and fitted with brass bar handles, it is most suitable for burial. The Bow is a light oak veneer coffin fitted with brassed handles. It is a traditional English coffin with flat lid and flat side panels. It is suitable for both burial or cremation. The Upton is a light oak veneer coffin with raised lid and detailed side panels fitted with brassed bar handles and T-Ends. It is suitable for both burial or cremation. The Knightsbridge is a hand built traditional English casket using high quality Oak veneer, shown fitted with Oscar bar handles,T-ends and wreath holders. It is available in either a Light Oak veneer or a Sapele veneer. The Sapele Bow is a Sapele veneer coffin fitted with brassed handles. It is a traditional English coffin with flat lid and flat side panels. It is suitable for both burial or cremation. The Chelsea is a Sapele veneer coffin with raised lid and detailed side panels fitted with brassed bar handles and T-Ends. It is suitable for both burial or cremation. The Bayswater is a hand built traditional English casket in solid Oak with routered panels and corner posts, shown fitted with No.3 casket bar handles, T-ends and wreath holders. It is also available in Solid Utile.